Surface to complete construction: stone work & masonry services. Skilled Phoenix masonry and landscaping contractors. Popular Valley home features are front yard gardens and outdoor living spaces that require brick, adobe, stucco, concrete and stone masonry. 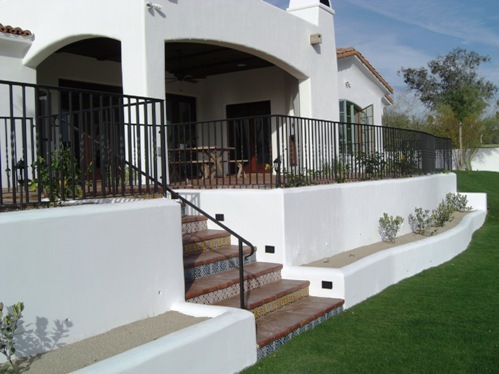 Desert Crest is highly skilled in this trade and provides the services of your landscape and home exterior and interior masonry contractors company work with a general contractor’s license. We do both mortared and dry stone mason work. You will also find that we are accomplished in Scottsdale – Phoenix brick and block work. Visit Our Portfolio for more examples of our masonry work. The application of masonry in landscape design is seen in many facets of curb appeal and backyard landscaping, allowing us to do every portion of the job, without having to rely on other utility or masonry contractors for completion. Additionally, if you’re interested in other home improvement projects that require masonry services, you can enjoy the high quality of Desert Crest craftsmanship in many places beyond landscaping needs.